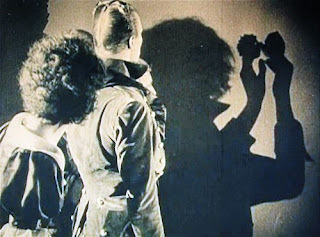 At the time of production in 1922, Warning Shadows was a remarkable achievement. Its purely psychological direction opened new attributes of the cinema. It was a rare instance of complete filmic unity, with the possible exception of the unnecessary roof-garden scene. The continuity of theme, the smooth development from one sequence into another, the gradual communication of the thoughts of the characters, were flawlessly presented. It carried an air of romance, of fantasy, of tragedy. Every filmic property for the expression of mood, for the creation of atmosphere, that was known at the time was used with imagination and intelligence. Its supreme value as an example of unity of purpose, of time, of place, of theme, cannot be over-estimated. Robison, an American brought up in Germany, shot the film entirely without subtitles, a startling new technique. The titles seen in today’s prints were added by a zealous distributor. The ambiguity of the shadows in the film has a Freudian inspiration. 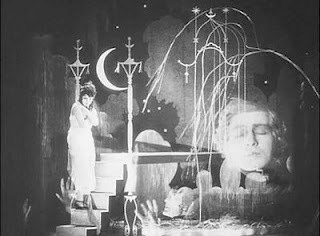 The little illusionist steals shadows and opens the flood gates of the repressed unconscious desires of the other characters in the film, who suddenly start acting out their secret fantasies. In a ph antasmagoria shadows temporarily replace living beings, who become for a time passive spectators. The pace of the film increases as it goes, and the slow rhythm of the opening is left far behind. The Germanic fascination with shadows and mirror images, of which tradition Peter Schlemihl is an excellent example, is related to the horror of non-existence – a state of mind that seems to flourish during and after wars with massive deaths on the battlefield. Thanks to an exceptional vigour of inspiration, the characters in this film free themselves from the abstract uniformity imposed by Expressionism. They act with an almost animal intensity. The version currently shown on Netflix has no interttitles.